In 2018 the General Assembly of Virginia passed a law making it illegal to use a hand held cell phone in work zone. However, hand held cell phone usage is not illegal in VA, yet . The research behind the decision to allow hand held cell phone use is based on the VTT study (see following) that used professional drivers to drive distracted and documented their driving. This study differs from other studies in that the decisions were not based on statistics but on actual driving observations. This study concluded that reaching or fumbling for the phone and the dialing tasks were more distracting than the actual phone conversations. For this reason the texting law covers dialing multiple numbers as well as sending a text or receiving a text. However, with updated statistics and more and more loss of life in recent years due to distracted driving, many are desiring to have the hand held phone in Virginia banned for the safety of all. The National Highway Traffic Safety Administration reported that in 2010 driver distraction was the cause of 18 percent of all fatal crashes – with 3,092 people killed – and crashes resulting in an injury – with 416,000 people wounded. In 2011, there were 28,619 crashes, 136 fatalities and 16,128 injuries attributed to driver distractions, according to the Virginia Department of Motor Vehicles. Today in our busy fast paced society, many people use technology to stay connected with family and friends, and for entertainment on a continual basis throughout the day. However, driving requires your full attention in order to be safe. It is not possible to over emphasize the importance of keeping your eyes and focus on the road! You cannot drive and participate in other activities at the same time! Looking down for more than one second at a text or phone number takes your concentration and eyes off the road long enough to result in tragedy. The average text takes 4 seconds. In that amount of time at 45 mph you have covered 264 feet. That distance is over half the distance of a football field, without looking. Really, is it worth it? April is as National Distracted Driving Awareness Month. Texting or talking on the phone are not the only activities drivers are participating in. Some drivers are eating, adjusting the radio, loading CD’s, putting on makeup, reading maps or looking at GPS’s , to just name a few. Virginians spend so much time in their car commuting from one place to the other, that the car has become an extension of the living room. Do not forget that driving is an activity with serious consequences and deserves your undivided attention. With the increase of vehicles on the road, extra construction, especially in warmer months, and all the other activity on the HTS, it takes your full attention to be prepared for changes up head. One 3 second distraction could change your life and the lives of those around you forever. Don’t Drive Distracted, PLEASE! A recent study by the Virginia Tech Transportation Institute shows that 80 percent of all crashes and 65 percent of all near-crashes are the result of driver inattention. Most distracted driving crashes involved drivers 21 to 35 years old. Most distracted driver crashes occurred at the end of the week on Thursdays, Fridays and Saturdays, between noon and 6 p.m.
1. Manual distraction: This takes place when you take your hands off the wheel to do something else. Loading a cd, fumbling for your phone, setting your mirrors, eating, etc, these are examples of manual distractions. 2. Visual distractions: Visual distraction takes place when you take your eyes off the road to look away from your path of travel. Texting, reading, looking at the radio, or allowing something outside of your path of travel to distract your vision. 3. Cognitive: Cognitive distraction takes place when your mind is preoccupied with something besides driving. Texting and driving involves all three types of this distraction. In Virginia it illegal to receive a text or send a text while behind the wheel. This includes extensive dialing. Your dialing should consist of verbal commands or one touch dialing. It take 3 seconds to be in a crash. Never take your attention off the road for more than 1 second. E:\phone more dangerous than passengers.wmv18 you may not operate a vehicle while using a cell phone, or any other wireless telecommunications device, including those that are considered to be hands-free. 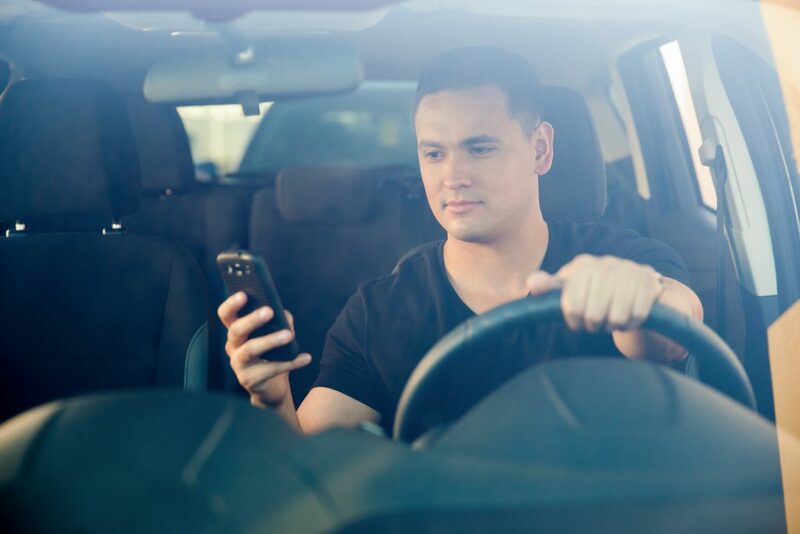 It is unwise to get in the car and began to make a phone call while you were on the road “doing nothing”, or to think or say, “I’m about to get in the car, I’ll call you while I’m on the road”. Although not against the law in VA, for drivers over 18 years of age, talking on the phone while driving is very distracting. When you are holding a phone and engaged in a conversation it is easy to have your attention on your conversation and not on the road. Driving requires alertness and concentration. It should not be “the other thing” you are doing while you are talking on the phone. It is difficult to concentrate on two tasks at once, especially a task that is as demanding as driving. At the very least hand free devices should be used and if available voice activated dialing. The safest thing to do, and really the most comfortable, is to pull over to talk on the phone and then proceed when you are finished. Or allow the caller to leave a voice message and call them back when you arrive. On April 3, 2013, Governor McDonnell signed a bill that made an initial texting-while-driving offense result in a fine of $125, while a second offense will cost $250. Texting, entering multiple letters or text from a hand held device while driving, was also elevated to a primary offense rather than a secondary offense, which means you can be pulled over and ticketed for texting. Reading a text is also included in this offense. This bill became law on July 1, 2013. In addition, a reckless driving charge (taking your eyes off the road) may be added to texting and will cost you an additional $250.00 in fines. When texting and driving, not only is your concentration removed from the road, but your eyes and hands as well. It is impossible to concentrate on the road and text.